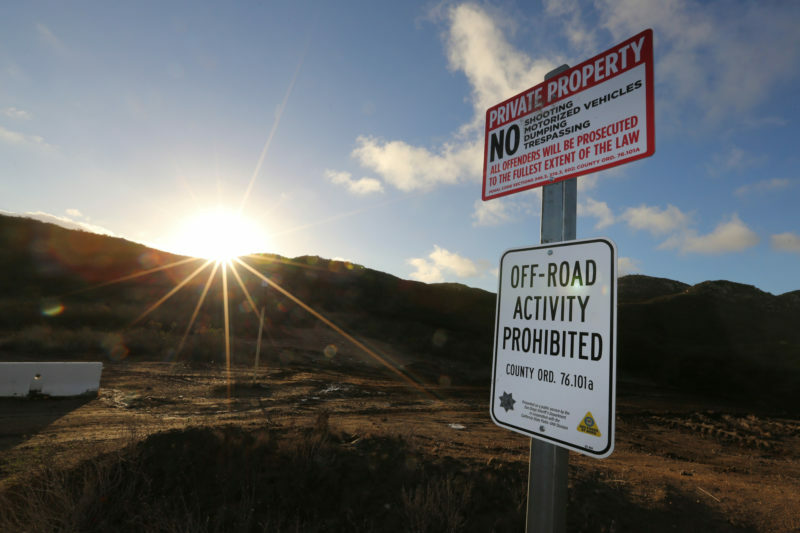 News coverage about the effort to oppose the Newland Sierra project casts the controversy as a fight between a profit-motivated sprawl developer and elite spas that don’t want their high-flying guests to be troubled by noise from heavy construction equipment. This framing misses the point. Voters around San Diego County are being approached to sign a petition on behalf of the Committee Against Newland Sierra and Bad Development. They’re trying to qualify a referendum for the ballot that would undo a perilously bad decision by the Board of Supervisors to allow 2,135 homes to be built west of Escondido near I-15 on some of San Diego County’s last remaining wildlands. Every voter who is concerned about San Diego County’s housing crisis, traffic and climate should sign the petition. News coverage about this effort casts the controversy as a fight between a profit-motivated sprawl developer and elite spas that don’t want their high-flying guests to be troubled by noise from heavy construction equipment. This framing misses the point. The Cleveland National Forest Foundation and Save Our Forests and Ranchlands, groups I lead, have opposed this project – in one form or another – for nearly two decades. There is longstanding, deep countywide opposition to developing this environmentally sensitive site. As far back as 2001, during the 2020 general plan update, there has been a cloud of political corruption surrounding plans to build there. Developers first proposed to build a massive master-planned project called Stonegate/Merriam Mountain that would have located more than 2,600 homes in this wildfire-prone area. Citing fire risk and the need to protect natural areas, the general plan zoned this land for only 300 new dwellings. Despite evidence that the developer tried to cut backroom deals to upzone the land, the Board of Supervisors ultimately rejected the project in 2009. Community opposition to the project was universal then, and it remains strong today. The same problems that faced the Merriam Mountain proposal plague the Newland Sierra plan, which was recently approved by the Board of Supervisors. Like Merriam Mountain, the Newland Sierra project lacks the required infrastructure (water supplies and roads) to support it and includes no realistic plan to tie in to regional public transit. The arguments for rejecting Merriam Mountain in 2009 are even more compelling today. The risks of climate change become more apparent every year. And while San Diego County’s housing crisis continues to worsen, it’s more obvious than ever that sprawl-style development will not solve the problem. A series of dramatic court decisions in recent years have exposed San Diego County’s approach to planning as a house of cards designed to make it easy for sprawl developers to gamble and win. They win big by buying land on the cheap that is designated for low-density development and then securing permission to exponentially increase the number of homes they can build. In the process, developers privatize enormous profits while the public pays for the extraordinary long-term social and environmental consequences of their projects. The recent appellate court decision in Cleveland National Forest Foundation v. SANDAG changed state regional planning law to require planners to at least consider planning alternatives that reduce driving, increase transit and support the development of more – and more affordable – housing in city centers. It’s simply unbelievable that San Diego County continues to act as if these court directives don’t exist. Similarly, a string of court victories secured by the Sierra Club and the Golden Door Spa have made it clear that the county has no business approving a sprawling development on this land. The battle over Newland Sierra has become an intense and expensive legal and political contest that requires extraordinary expertise in environmental law. Fortunately, these private interests have stepped forward to lead this complicated legal fight on the public’s behalf. True, the Golden Door is motivated to protect the pristine natural setting around its rather exclusive spa. But in doing so, it is also safeguarding the many neighboring communities surrounding this tranquil mountain. If it is true that our lives begin to end when we are silent about things that matter, then this referendum gives the people a loud and clear voice supporting transit-based building and a real, sustainable solution to the housing crisis that afflicts our region. Duncan McFetridge is a founding member of San Diego County’s Save Our Forest and Ranchlands and is the director of the Cleveland National Forest Foundation.